（1）Suit Collar. Straight placket. Suit buttons.Retro straight sleeves design with embroideries. 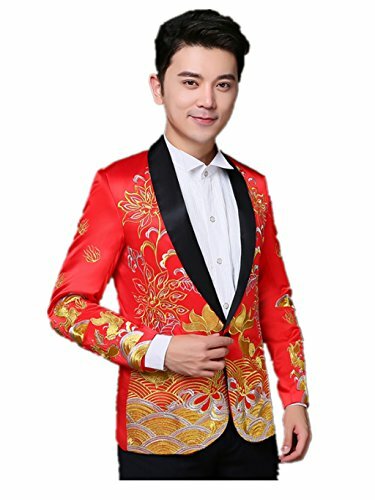 （2）Mandarin jacket：Stereoscopic straight cutting. Precision and fine embroideries (Golden fish, clouds, flowers pattern) on the front, sleeves and lower hem. （3）Material:100% Silk and satin. Feel comfortable.. Color:Red.Technics:Hand embroidery. （4）Style: Retro and fashion. Suitable for Bridegroom. Wedding,banquet,show,photographic studio. Spring, Summer, Autumn, Winter. If you have any questions about this product by YY-Bridegroom Wedding Suit, contact us by completing and submitting the form below. If you are looking for a specif part number, please include it with your message.